Since our new control panel works a bit differently from its predecessor I will be trying to post short tutorials on various aspects of it over the coming weeks and months – sorry for not having done more recently! Today we’ll have a very quick look at managing MySQL databases from the control panel. Please bear in mind that if you have multiple subscriptions (packages / plans) on your account that you may need to use the “Select Subscription” link to switch over to the hosting account you want to work with. Once you’re able to see the screen shown above you can select the “Databases” option to manage your existing databases OR to create new ones. Bear in mind that we offer several database engines on our new system so please be sure that you create the correct type! We offer MySQL versions 4 AND 5, as you can see from the screenshot, so please make sure you choose the correct version. here you can see the database server details that you will need to access your database either from a remote server or from one of our webservers. 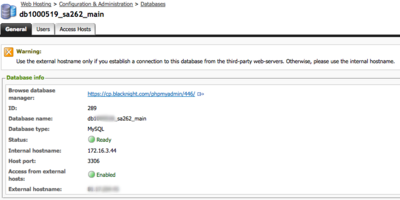 NB: you should only use the external IP address if you are accessing the database from a 3rd party provider. If your site is hosted with ourselves please use the internal hostname. 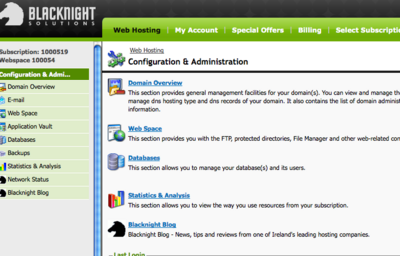 You can also manage users and access hosts from the same area. If there are specific things that you’d like us to cover do let us know!